Shade � For lightly shaded areas. This mixture requires some sun to thrive, but is very tolerant of those marginal areas under deciduous trees and along woodland edges. Perennial grasses with a turf-type �nurse� ryegrass that will germinate quickly and fade out once the fescues have become established. Creeping Red Fescue (40%), Chewings Fescue (30%) and Transist Intermediate Ryegrass (30%). 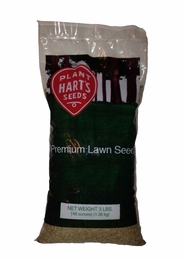 Open ground seeding rate: 5 pounds per 1,000 square feet. One half rate for over seeding. Expect initial germination in 5-7 days, complete germination in 10-14 days.